A semi-supervised version of Fisher’s linear discriminant analysis is presented. 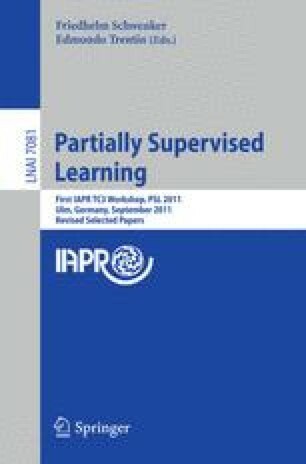 As opposed to virtually all other approaches to semi-supervision, no assumptions on the data distribution are made, apart from the ones explicitly or implicitly present in standard supervised learning. Our approach exploits the fact that the parameters that are to be estimated in linear discriminant analysis fulfill particular relations that link label-dependent with label-independent quantities. In this way, the later type of parameters, which can be estimated based on unlabeled data, impose constraints on the former and lead to a reduction in variability of the label dependent estimates. As a result, the performance of our semi-supervised linear discriminant is expected to improve over that of its supervised equal and typically does not deteriorate with increasing numbers of unlabeled data.